The technical dialogue between Kosovo and Serbia started in 2011 and resulted in 33 agreements. The agreements impacted various areas of people’s lives, including freedom of movement, civil registries, cadastral records, customs, local governance in the north, recognition of diplomas, regional cooperation, energy, telecommunication, justice, etc. Improving the lives of citizens and cooperation between them was one of the key priorities of the dialogue. Unfortunately, the dialogue process has been extremely politicised, to the extent that any positive impact on people’s lives was completely overlooked. The political discourse shaped the public opinion and leaned heavily towards the negative. Slow and lack of implementation of some agreements has contributed to this discourse. In turn, discussions on the implemented agreements and their impact on the lives of citizens has been marginalised. A broader reflection from the perspective of citizens would help us better understand the real and human impact of the agreements. My observations on the agreements and implementation described below are based on my personal experiences and those of other people in everyday public and private life whom I know. I live in Mitrovica and I work as a mediator at the Mediation Centre in Mitrovica. The centre is licensed by the Ministry of Justice, with the aim of facilitating access to justice through mediation and encouraging communication and mutual understanding between communities. Cases addressed in the centre are of judicial and prosecutorial nature. The centre serves members of all communities living in the Mitrovica region. Cases are referred by relevant justice bodies. The Brussels Agreement has made possible the integration of the judiciary in the northern part of Kosovo, including the integration of judges and prosecutors from the Serb community. Together with other Serbian and Albanian colleagues, I mediate cases referred by judges and prosecutors, including cases of disputes between members of different communities. In our daily practice there are cases of Albanian community members being handled by Serbian community judges, and then referred to our mediation centre. I remember a case where a number of young people from Albanian and Serb communities, were involved in a fight with each other in the north of Mitrovica. The prosecution in Mitrovica reviewed the case and then referred it to the Mediation Centre, where mediators helped resolve and bring the conflict to a close. Before the Justice Agreement was reached, judges and prosecutors from the Serb community operated under the Serbian system; judges addressed civil cases in their offices or apartments. Prosecutors couldn’t try criminal cases and were not allowed to cooperate with the Kosovo Police. Between 2008 and 2017, when the implementation of the justice agreement began, the Basic Court of Mitrovica operated in the building of the court in Vushtrri/Vučitrn. The Internal Audit Unit, of the Kosovo Judicial Council had assessed that the court building was not structurally sound and did not meet conditions for handling cases and holding trials. Due to limited space the court was understaffed. As a result, it was not possible to review all cases filed in the court. Cases would age and reach the statute of limitations. There were a considerable number of cases that inspectors filed on various violations by businesses that the court didn’t manage to review within the legal deadlines. This had an adverse effect on the lives of citizens and created an environment where the rule of law wasn’t fully operational and criminals would go unpunished. Citizens from the region had difficulty accessing the Basic Court of Mitrovica located in Vushtrri/Vučitrn away from Mitrovica city. Money and time spent commuting certainly added to the household budget. 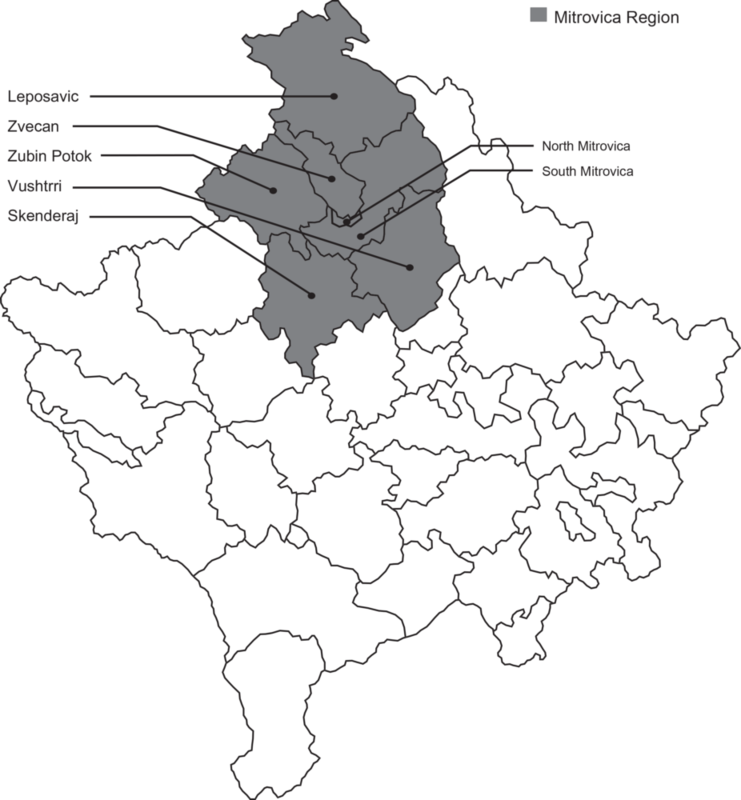 The Municipality of Vushtrri/Vučitrn and the Municipality of Skënderaj/Srbica are located to the south of the Mitrovica region, Zveçan/Zvečan and Zubin Potok to the north-west, Leposaviq//Leposavić to the north, and the Mitrovica North and Mitrovica South are in the very center of the region. To reach the court in Vushtrri/Vučitrn people had to travel around 12Km from Mitrovica, 45Km from Leposaviq/Leposavić, 30Km from Zubin Potok, 17Km from Zveçan/Zvečan, and 21Km from Skënderaj/Srbica. The Justice Agreement allowed for the integration of communities both in terms of the provision and access of legal services. The agreement made the Basic Court in Mitrovica functional again in the original building in the northern part of the city of Mitrovica and added a second building in the south of the city, as well as the integration of all court structures in the north within the Basic Court of Mitrovica. The agreement provides for the functioning of a Basic Prosecution and Basic Court in the region of Mitrovica, the branches of which include the provision of services in seven municipalities: Mitrovica South, Mitrovica North, Zveçan/Zvečan, Zubin Potok, Leposaviq/Leposavić, Vushtrri/Vučitrn and Skënderaj/Srbica. The justice institutions operate in accordance with the laws of Kosovo and their staff structures which includes an Albanian and Serb workforce. With the return of the court in Mitrovica together with the increased number of judges and prosecutors, including the integration of Serb judges and prosecutors, the number of processed cases has also increased. In addition to the difficulties in the justice sector, there were major challenges in other sectors too, which hindered cooperation in various fields. I have experience from the working on various projects such as good governance, citizens’ inclusion in public policymaking, equal access to justice, human rights, etc., from when I was working in Mitrovica North, Leposaviq//Leposavić, Zubin Potok, and Zveçan/Zvečan. These municipalities had various authorities with the same or similar powers as local government, including UNMIK offices, parallel municipalities, Preparatory Team of the North, and the Municipality of Mitrovica situated in the south. This mix of powers in local government made implementation of the projects more complicated. It was difficult and often times impossible getting the data that we – civil society organisations – needed from the municipality. None of the authorities cited above were able to accommodate our requests, as a result of unclear definition of municipal powers. However, after the local elections in the northern municipalities were held in 2013, cross-sector communication and cooperation between local governments and various organisations was facilitated, allowing for the completion of such projects. There were other challenges that delayed project implementation. When cooperating with various partner organisations and municipalities in the north, I was forced to use roaming calls to communicate with colleagues or organisations in the Serb-majority municipalities on the other side of The Ibër/Ibar River. As a result, phone calls were extremely high for both individuals involved from different sectors, not to mention ordinary citizens. Until recently, citizens in the north, including Albanians living in this area who used Kosovo operators Ipko or Vala, had to use roaming when north of The Ibër/Ibar River, which drastically increased mobile phone bills.. Consequently mobile communication from municipalities north of The Ibër/Ibar River with other parts of Kosovo cost as much as making interstate calls. For this reason, most citizens avoided communicating by phone from the four northern municipalities. This and many other issues in the past created a deep gap between the north and the rest of Kosovo. The initial Agreement on Telecommunications was reached in 2013. In 2015, the dialogue parties agreed on the action plan and the final agreement was reached in 2016. The agreement facilitated mobile communication in the four municipalities above The Ibër/Ibar River. In this regard, citizens living in the Mitrovica region have had their telephone costs reduced as it allows for an equal cost of communication throughout Kosovo. Such facilitations in the field of telecommunication has had a positive impact in increasing cooperation and communication between the citizens of the four municipalities north of The Ibër/Ibar River, with those living in other parts of Kosovo. Agreements that facilitated the provision of Kosovo IDs and driving licences to Serbs also had a positive impact. As a result of these agreements, there was enhanced inter-ethnic cooperation and greater integration among the communities. This was most visible with mixed staffing, where Albanians, Serbs and other communities in the Mitrovica region were working together. Members of the Serb community were also provided with Kosovo driving licenses, which allow the person and their vehicle free movement throughout Kosovo. My Serbian associates registered their vehicles in the relevant Kosovo authorities, and now use them to travel to different locations in Kosovo, thus building bridges of cooperation. Speaking of freedom of movement, I think back on various student exchange projects between Kosovo and Serbia. Kosovo students participating in these projects faced a number of challenges to enter Serbia. The organisers and students waited for hours to undergo verification procedures. Representatives of international institutions and organisations that funded the projects were also subject to verification. Serbian authorities only allowed students and organisers to travel to Serbia when the international embassy diplomatically intervened to support their travel. The Freedom of Movement Agreement helped overcome some of these difficulties when implementation began in December 2011. This agreement envisages free movement for people who hold civil documents issued by the applicable authority. Now, participants of such exchange programmes, just as other ordinary citizens with Kosovo documents, can travel to Serbia. However, Kosovo citizens who travel to Serbia with Kosovo-registered vehicles are subject to administrative procedures, and must obtain temporary license plates and vehicle insurance, resulting in long waiting times. I have heard many complaints from citizens waiting in long queues to pay for temporary license plates to Serbia’s police authorities, to obtain entry and exit permits, and other procedures. Citizens with “RKS” Kosovo license plates face the biggest difficulties. They must replace their “RKS” license plates with temporary Serbian plates. This procedure requires long waits and a payment of a fee. Day to day I have met people who told me they had to replace their vehicle license plates from “RKS” to “KS” in order to reduce the costs of travel and to shorten the waiting time. However, it is worth pointing out that the Freedom of Movement Agreement, despite these procedures, has enabled Kosovo citizens to travel to or through Serbia. This has also made possible the journeys of the Kosovo diaspora, who hold Kosovo passports, to travel through Serbia to Kosovo and vice versa. Despite the benefits deriving from the Kosovo-Serbia technical dialogue, I think the dialogue process should be more transparent to the public, with better articulated agreements and the effects such agreements have on the lives of the citizens. There should be regular information and consultation meetings with citizens and civil society throughout the process. Additionally, it is necessary to simplify the language used in the agreements and inform the citizens accordingly through information campaigns. This way, citizens could better understand the baseline agreements, particularly the positive aspects that directly affect their lives.